What conditions does Qsymia treat? List Qsymia side effects by likelihood and severity. Before using this medication, tell your doctor or pharmacist your medical history, especially of: high blood pressure, glaucoma, personal or family history of a substance use disorder (such as overuse of or addiction to drugs/alcohol), heart disease (such as chest pain, heart attack, heart murmur, fast/irregular heartbeat, heart valve problems), mental/mood problems (such as depression, thoughts of suicide, severe anxiety/agitation), high blood pressure in the lungs (pulmonary hypertension), stroke, overactive thyroid (hyperthyroidism), seizures, kidney disease (including kidney stones), liver disease, a certain metabolic imbalance (metabolic acidosis), a diet high in fat and low in carbohydrates (ketogenic diet). What should I know regarding pregnancy, nursing and administering Qsymia to children or the elderly? Some products that may interact with this drug include: orlistat, other stimulants (including amphetamines, methylphenidate, street drugs such as cocaine or MDMA/"ecstasy"). Does Qsymia interact with other medications? 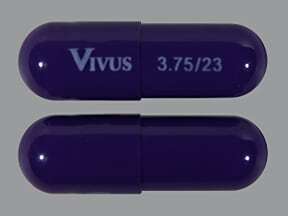 This medicine is a purple, oblong, capsule imprinted with "VIVUS" and "3.75/23". 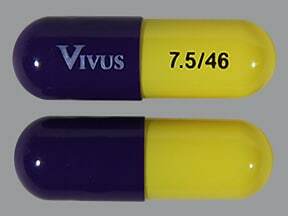 This medicine is a yellow purple, oblong, capsule imprinted with "VIVUS" and "7.5/46". 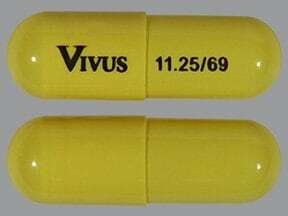 This medicine is a yellow, oblong, capsule imprinted with "VIVUS" and "11.25/69". 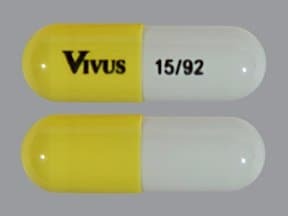 This medicine is a yellow white, oblong, capsule imprinted with "VIVUS" and "15/92". Are you considering switching to Qsymia? How long have you been taking Qsymia?